Whoever decided that November was a good month to start thinking about hibernating must have been living in a cave. Oh they were. OK that explains it. We’re not though – and guess what – there is no time like the present to fill your social diary with shenanigans a plenty. It’s time once again to swing from the dirty mother funking bass or stomp to the nasty kick and throw shapes from the first to the last funky groove. Paulette Makes You Move is all of that and a bag of awesome tunes. It’s a free monthly Friday party that rocks the house, tech and techno that Jill built when she learned how to Jack. Find me in the Pink Room at YES on Friday November 16th from 11-4am. Bring a change of clothes and plenty of YES MATE action. It’s a disco, funk and soul thing from 8pm – 2am. Pass by! Have a boogie and a cocktail. Munch your brunch, and toast your roast to the finest soul, funk and disco from myself and the ever wonderful Mr Will Tramp. 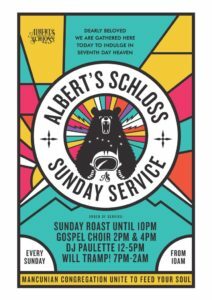 Then there’s live jazz from the Sunday Best Quintet and uplifting gospel sounds from AMC Gospel Choir and The Albert Schloss Feelgood Choir. It’s what Sundays were made for. I’ll be opening in the Refuge Public Bar, warming things up for Justin Robertson, Jon Da Silva and Jon McCready. Trevor Johnson will be in attendance with his exhibition of iconic artwork for eight iconic club nights. It’s a Hacienda thing. Prints are on sale and all proceeds will be donated to Forever Manchester. 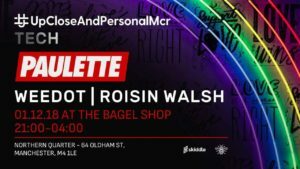 The UK’s most exciting Disco party La Discothèque turns 2 this year and we’re celebrating with a massive disco ding dong at the Albert Hall in Manchester on 24th November. Aside from a stellar line up including Kenny Dope Gonzales, Prinz Thomas, Detroit Swindle, Felix dixon, PillowTalk and High Hoops, The Massey and Paulette Project will be taking over La Piscotheque all night. Expect pure scenes. Officially opening on the 27th of November you can find me spinning tunes here on Mondays and Thursdays midweek. So welcome to your new home – disco, funk, rare groove and a little bit of house for those who like to dress up to go out. I’ll be sending all the eight balls in the corner pockets with my selection of old skool hip-hop, electro and r n b party jams.